The last PPC campaign I analysed in the ‘Analyse A Real PPC Campaign’ series was from Wiff, who had a really good search advert, especially from the fact that they were facing fierce competition from sponsored shopping results. The landing page was also very good, except for the fact that there was no candles visible on it (only the boxes the candles came in). Buying cars is something that many people are likely to Google search first to find out where to buy the car, whilst gaining more information on it too. With this, here is an analysis of a PPC campaign from Sytner. Straight away, it is clear the competition for this search phrase isn’t that strong, with only two adverts appearing of the maximum four. There is a problem with Sytner’s search advert too. There is nothing suggesting that is it about buying a BMW but selling one (from the URL and site link extension, in particular). This is worrying and sending traffic who want to buy a BMW to a landing page that is aimed at getting the web user to sell their BMW. This is, quite frankly, a waste of valuable PPC budget. What this suggests is that the keyword targeting by Sytner is not as good as it can be. Either they have chosen too vague keywords (such as just ‘BMW’) or, more worryingly, have not included any negative keywords in their PPC campaign. Negative keywords are keywords which you don’t want your search advert to bid and appear for. 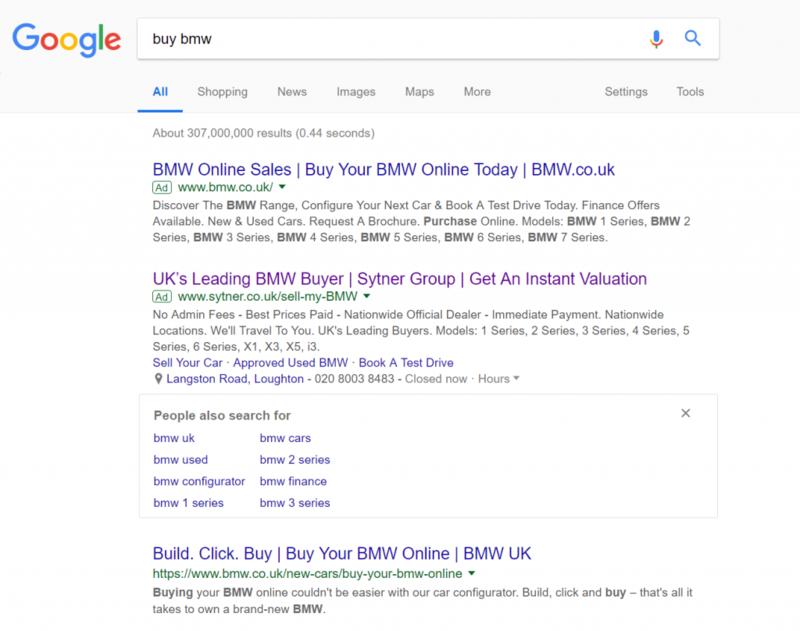 Obviously, if Sytner are trying to sell cars, then a definite negative keyword would be ‘buy’ – evidently, this has not been added as a negative keyword for this PPC campaign. Continuing from where the search advert left off, this is completely mis-targeted to what the web user is searching for. Unfortunately, this PPC campaign will most likely be achieving a low ROI for mainly this reason. 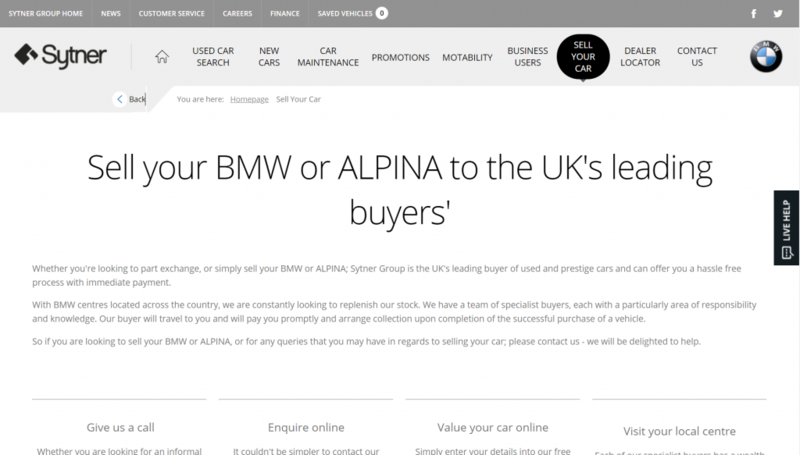 However, forgetting about the poor targeting, this is not the best example of a landing page, designed to get web users to sell their BMW car through Sytner. The first step to selling a car is getting a valuation, making clear that it should be a lead capture page. However, there is no form or lead capture on this page: just content. This goes against what is said in the description ‘Get an Instant Valuation’ – it is important for there to be a link between the contents of the advert to the landing page (and, in this case, there is not a link). Even if the right type of targeted traffic did reach this landing page, the conversion rate would not be as high as it could be if it was a lead capture landing page.